Our Completely Seamless Clip In Hair Extensions are made with the same flawless Russian Virgin Hair that we use in our salons for our permanent hair extensions every day! For the first time, clients who prefer an instant way of adding length and volume do not have to compromise on quality. The hair appears to sprout from the roots. It mimics your own hair growth. This makes these clip in hair extensions the most discreet product available on the market today. The finest hair available anywhere in the world. You are investing in hair that will last you for many years. Russian Virgin Hair has a more natural texture than other more processed hair (which can look artificially straight and coarse because of over-processing). It will stand up to heat styling very well. Our Russian Virgin hair has been used for 5 years in our London salons and is truly flawless. Guided by clients, we have designed these clip in hair extensions to be as flush to the head as possible, while still allowing the hair itself to be nice and thick. The wefts come in 3 size variations. 1.5″ blending pieces – 12.5g each in weight with just 1 snap grip. These small pieces are used to make your hair extensions really versatile. You can choose to add them, or not, depending on the style you want. They are great to add hair around the front while being super discreet. 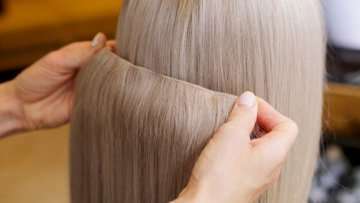 When matching your hair to our range of colours, you should look at the ends (last 4 inches) of your hair only and look for a shade that matches, or is just slightly lighter (rather than darker). Many of our colours have slightly darker roots which is more realistic (most clients have darker roots). The majority of our colours are multi-tonal which is perfect for most clients, whose hair is never a flat colour! Returns are accepted within 14 days for a full refund or exchange. The product must be returned with the seal unbroken. The product must be returned at the buyer’s expense. It is advisable to return the product using a tracked service as it is the buyer’s responsibility to ensure it is returned.